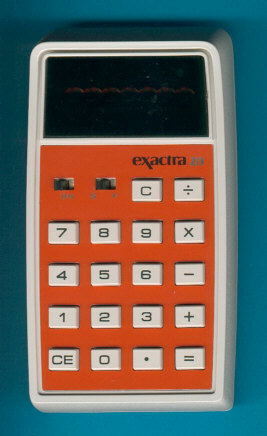 Texas Instruments introduced early in 1974 the Exactra line of calculators with the handheld models Exactra 20, Exactra 21, Exactra 22 and Exactra 23. The line was complemented with one desktop calculator named Exactra 31. The Exactra calculators do not use the name of the manufacturer on their nameplates, you have to read the small printed on the reverse to locate the Texas Instruments logo. The reasons are not clear, let us assume that in the middle of the decline of the calculator prices the marketing guys tried to establish a low-budget line. The differences between the handheld models are minor, the Exactra 20 makes use of a small 6-digit display while the other and more expensive models sports an 8-digit display. High-end models added some functions and a connector for an external power supply. Did you notice the "bubble lens" to magnify the small LED display? One of the most sought part of any Exactra calculator - don't miss the Star Wars: Episode IV - A New Hope (1977) story and learn more about the Exactra Calculator LED Displays. The Exactra 19 was the result of a very aggressive cost-reduction program initiated by The Ohio State University, read more about their Classroom Experiment. It dropped the sliding switch to use either fix point or floating point notation, the large keys with injection molded lettering and even the double-sided printed circuit board. Dismantling this Exactra 20 manufactured in August 1974 by Texas Instruments reveals a very clean and simple design centered around the TMS0135 single-chip calculator circuit and a tiny display driver. The remaining parts form a small power-converter to use the 3 AA-sized batteries instead a 9V battery block. Compare this calculator with the European TI-2000.